Bethesda resident Karel Robertson was a nurse at the Cornell Medical Center in 1970 when she heard a radio report about a bombing in Cambodia. She had known a number of young men who had been drafted and she wanted to do something to help them in Vietnam but not as a nurse. She found out about the American Red Cross’ Donut Dollie program, and so she applied. The following year, she learned she had been accepted into the program. 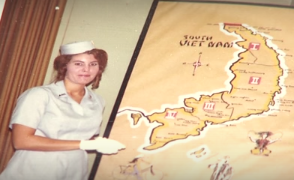 MyMCMedia’s Sonya Burke recently sat down with Robertson to learn more about her experiences during the Vietnam War as a Donut Dollie. Robertson said she has never been back to Vietnam since her work there as a Donut Dollie but she does hope to visit the country again. Montgomery County will be saluting its Vietnam veterans on Oct. 24 at the Universities at Shady Grove. If you would like to attend the tribute, register here. You can find out more about the Donut Dollies who provided some comfort and who served as reminder of home to the soldiers in Vietnam here.